Terrific any time of day, this combination of classic ham and cheese with mustard and red pepper flavor gives it pizzazz. In a large mixing bowl, whisk eggs, milk, dry mustard, red pepper flakes, and salt. Add bread pieces, stirring to combine; set aside. Heat oven to 400° F. In a large 10-inch ovenproof skillet, heat olive oil over medium high heat. Add potatoes and cook until golden and beginning to crisp. Add ham and cook, stirring often, for 2-3 minutes more. Push ham and potatoes to the side of the skillet; pour egg mixture into skillet, stir over heat and when the eggs begin to set up stir together, combining the ham, potatoes and eggs. 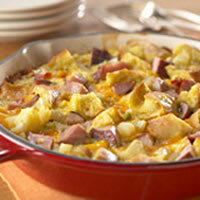 Stir in cheese and place skillet in a 400 degree F oven for 10-15 minutes until cheese is melted and eggs are set.